The North American PlayStation Blog adopted one of the nicer features from their European counterpart today, by changing the way they announce PlayStation Plus updates. In the past Sony would only reveal additions to the Instant Game Collection on a weekly basis. The new reporting method still allows for those updates, however, from here on out we will also get a preview at the start of each month that details all the major content (in no particular order) coming to the Instant Game Collection. While this won’t provide Plus members with an exact schedule of updates (you will still need to check each week to see what is arriving), it will let everyone know the games that are on the way for that month. Hopefully, this will cut down on the instances of Plus members purchasing a particular game, only to find it added to their free Instant Game Collection in the following week. 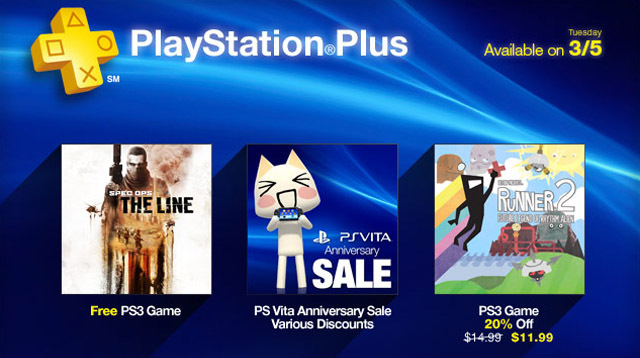 Tomorrow’s PlayStation Store update will add Spec Ops: The Line to the PlayStation Plus Instant Game Collection, and give Plus members a 20% discount on BIT.TRIP Presents Runner2 Future Legend Of Rhythm Alien (which brings the game down to $11.99 for its PSN release). Overall, a very nice update date for PlayStation Plus members this week and the rest of the month is not looking to shabby either!